Peterborough United are in dispute with Crystal Palace over the sell-on fee due following the sale of striker Dwight Gayle to Newcastle United. Palace sold Gayle to ‘The Magpies’ for £10 million last week and reports in the North-East suggest Posh were entitled to in excess of £1 million from the move. Posh sold Gayle to Palace for £6 million in July 2013 and attached the usual sell-on and additional payment clauses. 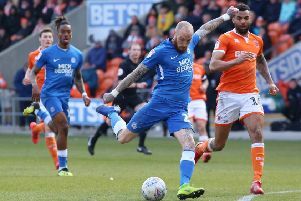 Posh director of football Barry Fry, the man in charge of transfer negotiations at the ABAX Stadium,, insists the sell-on clause remains in place. Fry also revealed a deal in principle to bring left-back Callum Elder back to Posh on loan from Leicester City has been agreed by the clubs and the player, but the move still depends on Elder signing a new contract with the Premier League champions - and the financial implications for Posh. Fry added: “The player wants to come back and Leicester want him to come back, but until Callum signs the new contract at Leicester we don’t know where we stand. “If Callum’s deal is worth £5k a week and Leicester want us to cover that £5k the deal won’t happen.